3200 years later Dorothy Eady (aka Omm Sety) is born into an Edwardian family in London. After recovering from a fall, young Dorothy begins to remember a past life in ancient Egypt, with a beautiful temple and a garden filled with exotic flowers. But no one believes her and Dorothy realises the only way to understand her past is to return to Abydos. 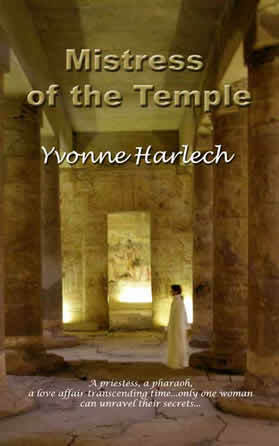 The truth lies in the Temple of Sety I where she must decipher its mysterious hieroglyphs. But first she will have to get to Egypt—and find a way back to this ancient village, perched on the edge of the desert, the gateway to eternity. The locals affectionately call her Omm Sety and the legend begins to unfold...Follow her amazing journey through three millennia of history, back to a past life that mirrors her own existence, where ancient secrets are about to be revealed. An imaginative fusion of fact and fiction...interweaving the past and present into an enriching novel about love, memory, and the enduring power of ancient Egypt. "Yvonne Harlech is mistress of her craft and has a real gift for moving seamlessley through time and states of consciousness...the reader becomes happily lost in a dream that may not be a dream...what a pleasure of a book!" Catherine Dees, co-author Omm Sety's Egypt and Editor at St Lynn's Press. "Through her descriptive storytelling Harlech seeds us with ancient wisdom, using historical fact and mythology to weave a beautiful tale." Leslie Zehr, author of The Alchemy of Dance and Director of the Centre for Sacred Arts, Cairo. "Yvonne Harlech very obviously has a major love for Egypt. Her passion for this era leaps off the page at you and you find yourself absolutely absorbed. Feeling the desert sun burning your skin and just wishing you could be there at those feasts! It’s rare to come across a biographical novel that is so engrossing... Thoroughly enjoyable, rich and satisfying; Mistress of the Temple has entered my top ten of favourite books and is unlikely to be removed." Rachel Malone, Historical Novel Society Review.